JADAPTIVE specializes in Secure Shell (SSH) solutions, a secure communication protocol supported by all major operating systems. SSH allows you to securely authenticate, execute commands and transfer files to remote servers. Every day across the globe, petabytes of information are exchanged and millions of scripts executed by products that utilize our software. We have been developing and supporting Java SSH solutions for over 15 years and provide fully supported SSH APIs for Java software developers, released on a regular maintenance schedule and kept up-to-date with the latest security specifications. 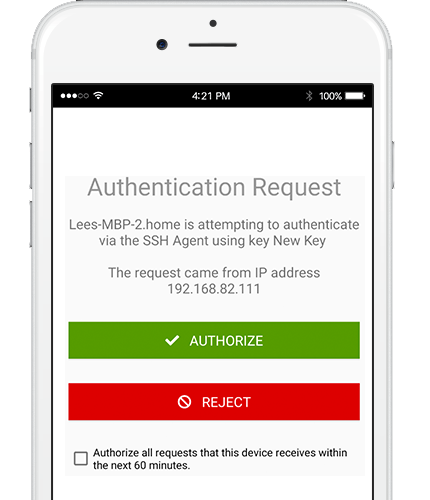 Increase personal SSH key security by authenticating with SSH keys stored securely on your mobile device. Looking for SSHTOOLS Limited? JADAPTIVE is the new name for SSHTOOLS Limited. Secure Shell (SSH) is a network protocol used for secure data communication, remote shells and command execution. You may already be familiar with using the ssh command on Unix-type systems. SSH is also the foundation for the Secure File Transfer Protocol (SFTP) which is used to transfer files securely. If your solution needs to communicate securely with another host, then SSH provides mutual authentication and a secure environment to execute commands, transfer files via SFTP/SCP or connect to other TCP based services on either side of the connection. Our customers are building secure, reliable, communication solutions and want SSH APIs that are stable, fully supported and kept up-to-date with the latest specifications and security assessments. We generally release maintenance updates monthly to ensure our customers are at the cutting edge of secure communications. Our clients stem from all walks of industry and include many Blue Chip companies, defense contractors and other high-technology vendors specializing in VPN software, Internet hardware, and Internet communications. Over half of the top 10 Managed File Transfer solutions available on the market utilize our APIs for secure data transfer. Microsoft have now added support for SSH to both its Windows Desktop and Windows Server editions, making SSH the defacto-standard for secure and reliable communication across all major operating systems. From Windows 10 update 1803 onwards the console has automatic support for the ssh command and the SSH server is an optional component to install on all versions.